Shine a Light: Southern Belle is home! Finally. Motoring to our mooring looking out across Pittwater, Lion Island and Barrenjoey Head to the right. The resolute Captain and his crew of friend John arrived back in home waters on Friday afternoon. This was after an almost epic voyage from Southport, Queensland lasting over 7 days. They had great weather but an electronic part of the auto helm broke down and stranded them in Coffs Harbour for 2 days and a fridge repair took another 2 days in Newcastle. All is fixed now and Miss 'Southern Belle' sailed back home looking fabulous. Both the auto helm and the fridge performed perfectly during our voyage up to Cairns, out to the Louisiades and back to NSW waters but decided to break down close to home. Well done to them. I couldn't imagine what it would have been like to go without either for any part of the trip. Molly and I met 'Southern Belle' at the dock of the RPAYC about 5:00pm and we decided to stay the night and go to our mooring and then home the next day. There was a car load of things to take off the boat and she needed to be washed down. At one point George looked at me ... I was just standing looking at the boat and him and smiling .. and said, "What are you smiling at?" "I'm happy you're both home safe and sound. Now I can stop worrying." 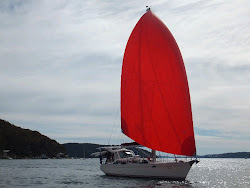 This weekend was the Australia Day long weekend which meant the boat only had a days rest. We were back out and headed down to our usual cruising grounds for 3 days together, once more, our little family. It took a bit of time for Molly to get back in the swing of the boat. She did a lot of looking at the shore line and gripping the side of the cockpit .. look at her nails holding on. Poor little working dog. Bet she wishes for a farm and sheep sometimes. Bless. Normally we have a big day out on Australia Day with our friends Keith and Jenny but we missed out on that this year due to simply not knowing when the boat would be back. We tried to catch up with some friends from the yacht club but that didn't work out either. Probably for the best. It was good to spend some quiet time together. I think the time provided George with a chance to get back into "home life" mode. He's going to miss the everyday boat life a great deal I think. Man and dog. They love their nap time afloat. I feel the need to get moving on my resolutions for the year. I've joined the gym so back into that 3 days a week. The daily 5:00pm wine will need to stop or at least slow down! And I've started preparing my work CV in hopes of landing a job soon. I haven't had to apply for a job or prepare a CV in nearly 30 years! Luckily when I left Fox after almost 25 years the phone kept ringing with people asking me to come and work so I didn't need to market myself. Now, after our wonderful year off, I've got to go looking because I know for sure that I need the mental and social stimulation work provides. Hopefully I'll find somewhere that's smart enough to understand there's a great deal of value in this 63 year old woman! As far as I'm concerned age is just a number and has nothing to do with the package.